Blue Ceramic Mug: Et tu, brute? but I'll forgive them :) It's a weird size, and I'm the only person I know who requires circs in such odd sizes on a regular basis. I was pretty sure I had a set of size 13, but I can't find them now (big surprise). I also picked up a lovely 16" circ (size 7) from Knit Picks - I love it, the needles are so SHORT! 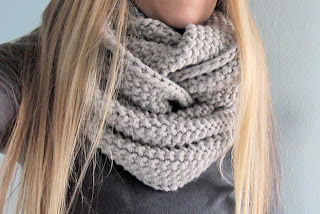 - for knitting hats, and the latest Creative Knitting. 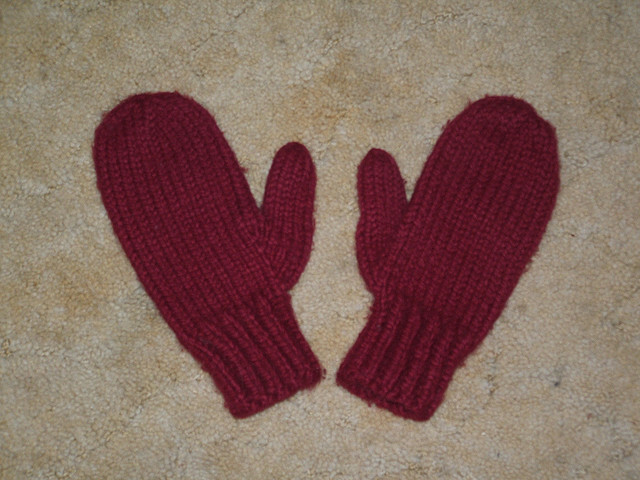 I'll continue hunting for the size 13 circ, although it won't be a big deal until I'm finished the mittens. K wants these done in Lion Brand Wool-Ease Thick & Quick, and I'm all about the bulky when it comes to stuff I'm knitting for others! She bought the yarn, and it's currently sitting in a bag on my couch waiting to be turned into warm wooly goodness. In other news, I feel like absolute crap. I woke up with a mild headache which, by the time I got to the office, became a raging migraine and my usual cocktail of diet coke and Tylenol Ultra isn't helping. I did manage to stay on track with day one of South Beach until mid-morning when I started feeling really nauseous. It's only gotten worse over time, so I'm skipping lunch in the hopes of not ending up in the bathroom all afternoon. (at the office - that would be so classy) I suppose I shouldn't be terribly surprised since the ten-year-old lost her dinner last night - I had attributed it to her eating too fast (which happens on occasion), but I suppose it's conceivable that it was some kind of bug. The other possibility is that this is one of those weird migraines that hangs around until I throw up (I hope not... I hate throwing up). In the interests of full disclosure, I did a Very Bad Thing last night. After the kids had gone to bed, I went into the kitchen and cooked a steak. No idea why. We'd already had dinner. I wasn't hungry. But I wanted a steak. So I cooked one. Then I sat down at the computer with my plate, and I burst into tears. I looked at the steak and was reminded once again that I'm an evil saboteur and that I certainly didn't need a steak at 9:30 in the evening. The twelve-year-old is a far better child than I deserve, and he took the plate away so that I wouldn't be tempted to eat the steak after all was said and done. (yes, he got out of bed to do this) I felt so guilty and disgusted with myself that I phoned Rob in tears and then got on the treadmill. This morning, I had to scrape 1/4 inch of ice off my car (it took a while, this was very stubborn ice) so since last night, I've had a pretty thorough full-body workout. I'm hoping the upset stomach passes soon, especially as I have yoga class tomorrow, and yoga is no time to have sore abdominal muscles.